The Omniguard is a cellular differential pressure recorder in a completely self-contained package, designed from the beginning to be extremely flexible yet easy to use. The included accessories (OG USB cable, owner’s manual, 10' hose, a spare roll of paper and AC cord) store easily in the lid. There’s no AC adapter to keep track of. It’s easy to find a convenient spot to place the unit since the new Omniguard is not position-sensitive and can be hung by a nail. Accurate measurements continue even if the unit is dropped or moved. The Omniguard Cellular includes the first 2 years of service utilizing the Verizon Wireless Network. Cell service is activated at your discretion. At the end of the first 2 years of service, contact ESI to renew the cellular service annually. Service is provided by Engineering Solutions & Verizon. Please see manufacturer for further details. ems is not responsible for any charges associated with this service. The backlit graphics display provides the easiest setup possible. Pressure is indicated with large easy-to-read characters and alarm setpoints are always displayed. Screen icons show the monitoring, printer and audible alarm status with a glance. Detailed information for job setup, feature settings and operating instructions are available on-screen at any time by pressing the help key. Troubleshooting topics are also covered. Pressure readings are time stamped and logged into memory once containment has been established. Audible and visual alarms activate whenever the pressure reaches the alarm setpoints. The Omniguard ensures the site inspector that proper containment was maintained. Logs and summary reports can be printed at any time for easy inspection of the monitoring data. Durable and reliable, the NEW Omniguard is clearly the contractor's choice for containment monitoring. Touch Screen navigation interface to access all settings & menus. 4.3" Color LCD (480 x 272 pixels), 3x larger than previous version. Larger viewing window in case easier to see from anywhere in job site. Color indicators on LCD screen make it easy to see status of the monitor. 4MB of log space; now holds 6+ months of normal job logs, 8x more than the Omniguard 4. User friendly interface makes set up and navigation quick and easy. International power supply operation, 80-240VAC 50-60Hz. Multilingual (French & Spanish coming soon). 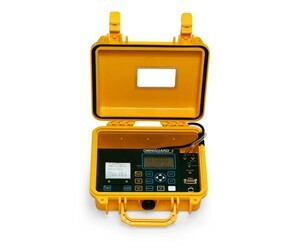 Omniguard is still the most accurate & easiest to use manometer on the market! Uses the same accessories and cables as the Omniguard 5, so your investment in accessories is not lost.